Here is a Special Link to 1989 Graduates Guestbook . . .
Beginning at 7 p.m., there will be $3 drink specials and a variety of light fare for $6. We are in search of some speakers to hook up to an iPod (loaded with some of those classic 80’s tunes! ), so if you have some we could use, please let us know. Marina North Shelter reserved from 10 a.m. to dusk, so come relax and share some laughs from the prior evening either solo or with the entire family! There is now only 1 week left to PAY and/or REGISTER at www.grandislandclassof89.com. If you have not already done so, please start your week by doing so today. Our growing Attendee list has been updated! PAY today...the deadline is next Monday, June 15th -- pre-payment saves you the $5.00 Village Inn cover charge -- pre-payment also guarantees a Classmate Directory, a Souvenir Name Tag and will ensure there is plenty of food and enough bartenders on Saturday, too! PAYING and REGISTERING are separate....please REGISTER even if you cannot attend...this will help out so much! The next email will include a list of all those who have REGISTERED a profile, as there are some that have PAID and have forgotten to go back to REGISTER. We are really looking forward to seeing everyone and enjoying all that we have planned for each of you! Many, many thanks to all that have cooperated with PRE PAYMENTS and REGISTERING...we really appreciate it, as it makes our jobs easier! Welcome! It is now time to click http://www.grandislandclassof89.com to pay and register your on-line profile for our Classmate Directory! 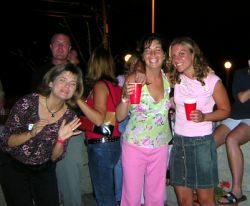 It is also where you’ll soon find all updated details for the events planned on the weekend of June 26-28, 2009. As the subject line indicated, you only have until May 1st to pay $45 per person for the Saturday night Grand Island Holiday Inn event. This is the reunion’s main event which now looks to be the best attended evening. As many of you have indicated on your registered profiles you will be attending, we are now (!) in need of your payment to secure the Ballroom that will comfortably accommodate our group. We will only reserve what we commit to with payment, so as with any similar function, your RSVP and payment are not only crucial by May 1st, but it will save you $10, as any tickets purchased after that date will be $55. See the website for details on how to submit or mail your payment and also register your profile, too. Note: Though the Holiday Inn provides a nicer venue than the other planned events, it will still be a relaxed and informal as there is no sit down meal or assigned seating. 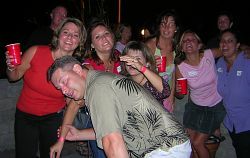 It is an evening that includes great appetizers, 4 hour open bar, a DJ ready with some of the classic hits of the 80’s, your personal copy of the Classmate Directory, a viewing of our class slide show including pictures from our 10 and 15 year reunions and a few surprises. Did we mention how crucial your payment and support is? We are now seeking sponsors for our Classmate Directory and website. For only a $50 donation, we will provide advertising for your organization, company, employer or whatever(!) in both our Classmate Directory and on our website. If you are interested, please email Amy at thesamplinskis@aol.com and I will thank you and put you in touch with our website creator, Annmarie (Buscaglia) Vanini. Though we have made attempts to contact those without emails via phone or the post office mail, some letters have been returned and we are still in search of many individuals and/or their email addresses. See the website for a list of those “missing” and either contact them directly or provide us their email so we may include them on future emails. At 5 p.m., gather at the high school to tour the much renovated building to check out where Mrs. Harper still sits in the halls today, the Rock, the new Music addition, the sports fields, and the almost unrecognizable front entrance, office space and Senior cafeteria. The school store will also be open to purchase Viking related items! The Marina North Shelter is reserved from 10 a.m. to dusk, so come relax and share some laughs from the prior evening either solo or with the entire family! 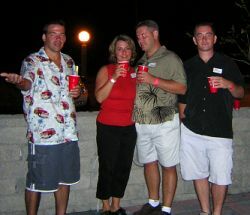 Congrats to Missy Mroziak Hartwick for winning a $25 bar tab for the reunion weekend! Thank you to all who made payments by the March 1st deadline…it helped tremendously! We have had some fantastic help and are still welcoming more. Please see the reunion website “Committee” page to see who can be credited for the various events, projects and tasks. Keep checking www.grandislandclassof89.com for updates and contact fellow classmates with this information and the web site address, so they don’t miss out!
. Again, please click www.grandislandclassof89.com to pay and register today! Jan. 22, 2009 . . .Our 1st reunion meeting took place a couple of weeks ago and those able to attend have been very busy gathering details. We are excited to announce our Grand Island Class of 1989 web site has changed! Click http://www.grandislandclassof89.com to pay and register for all events planned for June 26-28, 2009. As we do not yet have adequate funds to secure the deposits required for the events of the weekend, we kindly ask that you submit payment as soon as possible to enjoy $10 off the price of each ticket. All names of classmates with payments made by March 1st will be entered into a drawing for a soon to be announced fabulous prize! Keep checking http://www.grandislandclassof89.com for updates and contact fellow classmates with this information and the web site address, so they don’t miss out! Should you have any questions about the events or would like to offer your help and be added to the Reunion Committee, please contact Amy at thesamplinskis@aol.com. If you have already contacted me to help and have not yet been assigned a task, there will be several opportunities to help as the event details get ironed out and the reunion gets closer. Our 2nd reunion meeting will be in early March. Again, we welcome all help and hope to see everyone at all events! The specific details have not yet been decided other than on Saturday, June 27th we will celebrate with the "big" semi-formal/business casual event at the Holiday Inn on Grand Island. On the evening of Friday, June 26th we will casually kick off the weekend at the Village Inn on Grand Island with a beer & wine tent event. Please check back at www.Isledegrande.com for more details coming soon and email Amy (Pelczynski) Samplinski at thesamplinskis@aol.com if you can help with the event. 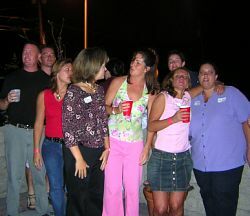 The following articles/photos pertain to the 2004 Class of '89 reunion. Close to 40 people attended our 15-year reunion. The Brick Oven did a great job in hosting the event, and we ran a 50/50 split which raised $111 for the next reunion. Throughout the night, we collected updated mailing and email addresses from most of those in attendance, which will help in the future. If you know of a classmate who would like to be added to the list, please send me their information. I was disappointed to see that the very few pictures I managed to take, didn't come out very well (outside in the dark ...imagine that? what was I drinking...I mean thinking?!). I've attached the few that did come out, but as you can see it only shows a handful of us....sorry. Hopefully, someone has some good pictures. If you have some, please send them to me so I can post them on the Isledegrande.com website for all to see. If anyone has any questions, please send me an email and I will respond as soon as I can. It was really nice to see everyone. I am sorry for the delay in updating all of you who were not able to attend. Keep me posted of any email changes. I wish the best to all of you and look forward to seeing more of you at the next event.  Includes draft beer, wine, soda and pizza! Please contact your fellow classmates with the above information.